This post includes the birthday games for kids. While throwing a birthday party for kids, we always think interesting games that could make fun & enjoyment at the birthday party. If you are running out of birthday game ideas, here you will get all the innovative games to make your party memorable. Here we have added cool birthday games which could be played and managed without too much hassle. This game is about dancing on the music beats. When the music stops, the kids have to be a statue. If anyone moves, he/she will be out. One who will make it to the finals will get candies & surprise gift. Play the music until you get the winner. All kids will sit in a ring and pass this hot potato to each other on the beat of any music. The plan is to imagine the potato is very hot & you have to move it as fast as you can from your hands & pass to the kid next to you. But when the music stops whoever is holding the potato will be out of the game. You have to carry on this game until only one kid is left & he/she will be as a winner of Hot Potato Game. Before the birthday party begins, we have to put a box full of candies or chocolates in a room. Then we have to write the clues about that box. You have to give the first clue to them & if kids find the first clue & this will to another & this goes on and on until they find the box. You make this game quite exciting by selecting a wider room & you could put the candies different boxes, shelves, drawers and other things that you can easily hide the candy boxes. 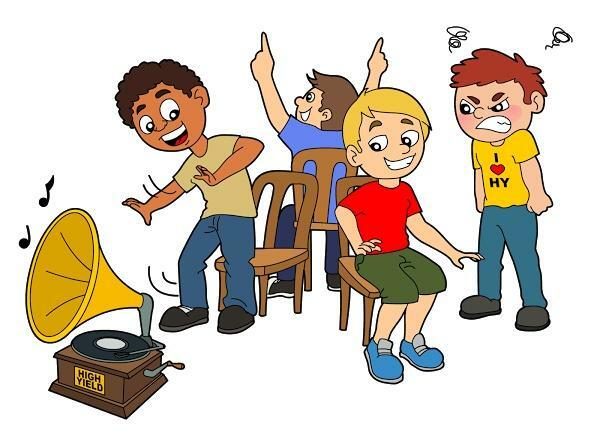 Musical Chairs is a conventional game played among kids. This game is very simple; all we need some chairs & a music system. The number of chairs should be one less than the number of participants. First, you have to arrange these chairs in two rows by keeping some gap between the rows. When the music starts, all kids have to move around these chairs & once the music is stopped they have to sit quickly on chairs. The One who doesn’t get chair will be out. In the next level, one more chair will be taken out and so on. This game will continue till one chair & two kids are there in the game. Finally, we’ll get winner between both of them. 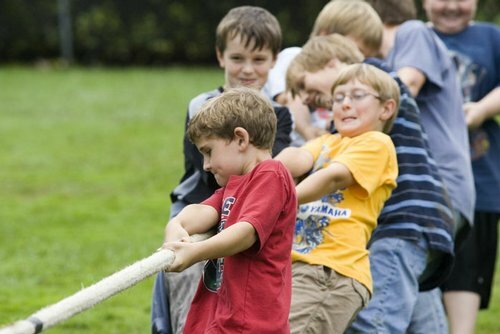 Tug of war is the game of strength. The kids will love to show their energy. In this game, two teams compete with each other by pulling a rope. First, you have to tie a ribbon on the middle of this rope & select a baseline; both teams will face each other by standing behind baseline. The team who pulls other teams to its side will be the winner & will get gifts. As we know the popularity of Harry Potter characters among kids, Quidditch game might be interesting. In this version of Quidditch, we need some broomsticks and ping pong balls for kids. There will be two teams & they have to hit the ping pong ball with their broomsticks into the goal of the opponent team. The team that scores more goals will be the winner. Hide and seek is one of the most extensively played outdoor game among kids. In this game, a person is selected to seek all the kids, First, he/she has to close eyes & count to 40 & at that time, all other kids will hide themselves. After the completion of the counting, he seeks the kids & if he finds one. That one kid will be the seeker in the next game. This game could be played simply in parks. All the kids will follow the commands of instructors. The commands could be stand up, sit down, hands up, hands down, turn left, right and back. Instructors have to mess these command in order to check the attention ability of kids. Like they could say hands up, sit down, turn left,sit down, stand up, stand up…. The one who doesn’t follow the order quickly or make mistakes will be out of this game & finally the one who has followed all commands correctly will be a winner. Jigsaw Puzzle could be the best birthday indoor game for kids. Children love to join the pictures of building, mountains, castles, nature and more. First, divide kids into teams. Put the all puzzles pieces in different boxes. Let the children chose the boxes, the first team to complete the image will be the winner. The Balloons are the things that could be more engaging for kids. Most of the kids love to play the balloon bursting games. First, you have to inflate the balloons & put some candies, chocolates inside it & spread these balloons over your place. Then you can tell kids to choose their balloon & then burst it. After the bursting of balloons, kids will get surprise goodies. This game could be organized without too much cost & kids surely love this game. This is a blindfolded game. First, you have to collect boxes & put something inside the box (Like Fruits and vegetables and other things). The one who tells the right names of vegetables and fruits will be awarded. The theme of this game will be about a monster & other kids. First, you have to choose a kid as a monster. When this monster touches other kids, they will be petrified & become like stone. The kids who have become stone, they could get a life when another none petrified kids touch them. If a kid is being touched three times by monster, he will be out of the game. The game will continue till a player remains none petrified. After Christmas, the birthday is the day that children love to celebrate. To make their birthday party thrilling, choose some of the above mentioned birthday games & make the arrangements for the game. We hope they will enjoy the party. If you have any thought related birthday party games, let us share with us. If you find these birthday game ideas exciting, please do share to your social friends. Thank you! !